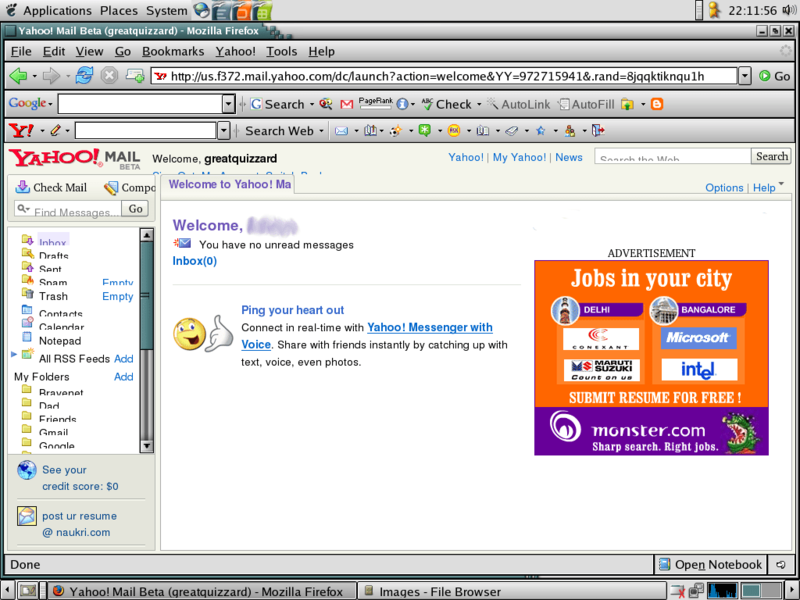 It has been some time now that I’ve been using the new look Yahoo! Mail, the Yahoo! Mail Beta. To be more specific, I’ve been using it since December 2005, and I wanted to be ABSOLUTELY sure before I made any statements praising it, because there are always hordes of Google fans protesting outside my (virtual) cyberdoor. Also, around the time I started writing this post, Yahoo! updated YMB, so I wanted to incorporate the changes too. I can assure you that after five months of using it, I can tell you exactly what it’s like. I may be booed by other Yahoo!ers for delaying this, but wine matures over time. Currently, Yahoo! Mail Beta is invitation-only, but you can always get on their waiting list. The loading time is far less than that of Gmail (or Windows Live Mail), and subsequent logins take even less because of caching. A major addition in YMB is the drag-and-drop facility; you can drag-and-drop emails from one folder to another. The search facility, which was horrible earlier (remember, you’re hearing this from a Yahoo! fan), has considerably been improved, and returns results faster. What takes the cake though is the tabbed interface. Let’s say you want to reply to an email, then the compose box opens in a tab, allowing you to switch between tasks in an uncluttered interface. The thing that’s missing though is that you can’t choose what to open in tabs by saying ‘Open (Sesame) in a tab’; only what Yahoo! decides opens in one. The first thing that hits you in the face as a whiff of fresh air is the refreshing new interface. 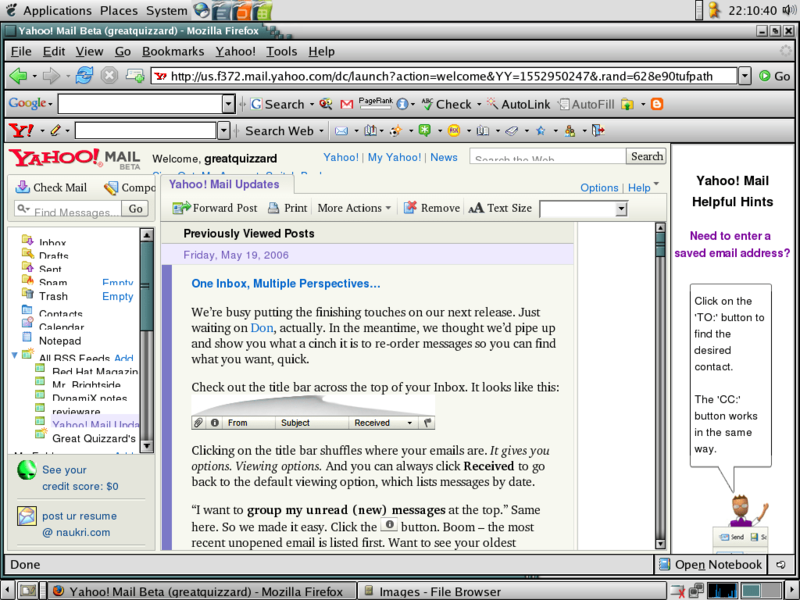 It has been designed to mimic the look of your average email reader software (like Mozilla Thunderbird or Eudora), down to it’s core in the way folders are arranged and the ‘reading pane’ concept, but all that in a web interface. I can assure you that it won’t be a reading pain; in fact, it’s far more convenient and a LOT quicker than the ol’ fella. The thing under the hood that enables this is DHTML (if you know what it is, I don’t need to tell you, if you don’t know what DHTML is, there is no need to know), which is used extensively in Yahoo! Mail Beta. The whole experience is far more dynamic (pun intended, for those who know DHTML), and lots of things now get accomplished under the hood, and faster at that. The thing I’ve GOT to tell you though is the reading pane. Rather than having to click on a link and having the email open in a new page, YMB gives a scrollable list of emails for a folder, and on clicking on an email, it loads immediately below in the ‘reading pane’. Loads faster anyway. More reading options will be present in upcoming versions, but for now, that’s it. The drawback though is that the current interface does not show the email size / attachment size (although an updated version on some accounts, like mine, has this), which can be irritating at times. Sorting can easily be done by clicking on the individual tabs. One more dumb thing – it will load links to ALL files in folder, which can get irritatingly slow sometimes when (like in my case) some folders have 1000 messages. Why not have a ‘Next 50’ or whatever option like anyone else? For a folder-freak like me, you no longer need to fret about insanely long pages. YMB addresses this problem making the list scrollable. Also, right-clicking a folder name presents a context sensitive menu for changing attributes. Another brand-new feature is the RSS feed reader. It is VERY handy, because you can check out what’s new on all your fave sites the same time you check mail. There are preset feeds that you can choose from a list, or you can enter the URL of the feed you want to subscribe to. How do you know something’s been updated? Simple, it’ll have a starburst icon next to it, although sometimes it ‘forgets’ to update a post as read. To mark it as read, just click on the body of the post. You have options to forward posts, or publish something you like to Y! 360 (if you have an account). Want to save a posts you like? Just drag-and-drop it into a folder of your choice. There is a problem I encounter though, frequently at that – the RSS reader fails to add feed URLs I enter that have Asian names, or uncommon names, or anything that may not be there in a dictionary. It can handle variations of normal words I’ve seen, but go that wee bit off the beaten track, and it’ll refuse to recognize the URL and say ‘Problem subscribing to feed. Please try later.’ Why this should be so, is beyond my comprehension. I wrote to Yahoo! about this, and they’re still scratching their heads. The message composer, as always, is THE best compared to the competition. No other mail service Coming to the message composer itself, the MOST improvement I feel is that change in the way users attach files. It now open in a new window, which means you can keep on typing text while the attachment is uploaded in the background, which was not possible earlier. One dumb thing though is that if you save a message as draft, then when you try to access it later, it opens as a normal mail, in the reading pane. What’s the point? Messages are saved as draft for editing and sending later, so it should open in the message composer. Also, spell checking was not available in Mozilla Firefox earlier, but the new updated version comes with that feature. Because of the tabbed feature functionality that opens the composer in a new tab by default, you can now refer to other mails while replying. Your Yahoo! Address Book is now called ‘Contacts’, and is no longer separate but integrated into YMB. Your address data will be automatically copied to this. THIS is the part of YMB that I’m most frustrated with. For one, although it’s faster, it compromises on features. No longer is grouping supported, though you can still make distribution lists. Even in data for a particular contact, it does not display nor shows all the fields in the earlier version, i.e., Yahoo! Address Book. Things like birthdays, websites, messenger names, adding contact to messenger list, and many more fields are NOT displayed. You need not worry though, because by visiting address.yahoo.com, you can still make changes the old way, and store data in categories not displayed in YMB contacts, and export/import contacts. Note that the data itself is not deleted, it WILL remain; just that it won’t be shown in YMB contacts and if you WANT to view it, you can go to your old address book for that. Hopefully, this thing will be ironed out by the time of the final release. Keeping the complaints rolling, Yahoo! Calendar and Yahoo! 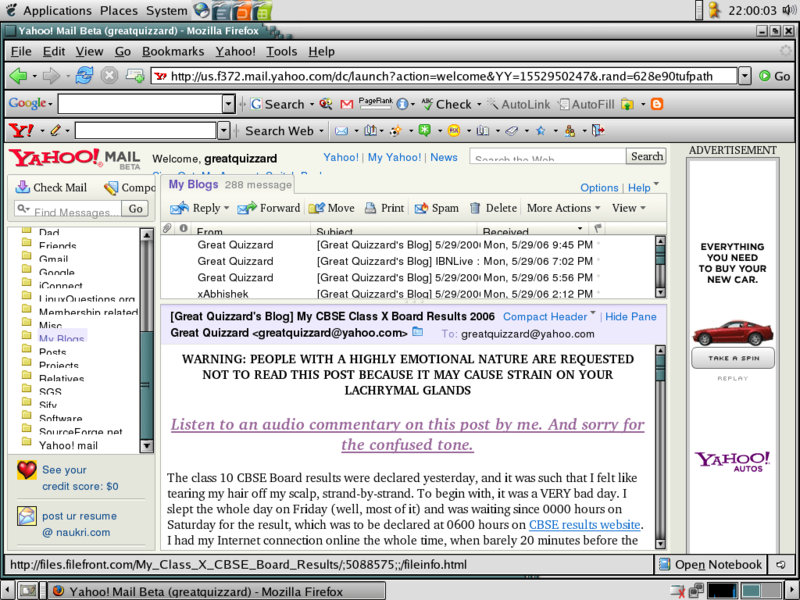 Notepad have not yet been integrated into YMB; you just have a link to the old thing opening in a new window. They better have versions of this in YMB fast, or Yahoo! risks losing out to ‘new players’ like Gmail who are integrating these features at a frightening pace (although their version is not as good as Yahoo!’s). Right now, the supported browsers are IE (even IE7 is supported in the new update), Firefox, Netscape and the Mozilla suite, with more to be encompassed in later stages. It even gives you very helpful hints while logging in, options if it fails, or if it failed to load the previous time. You can check your mail in the old version if it doesn’t work out. Even if you’re on an ‘untested platforms’ like Linux or Mac, don’t worry about the warning messages they give, because it works like a charm. And in case you sign in through an unsupported browser, it’ll automatically take you to YMB the next time. Any time, you can toggle between the new and the old version, IF you are part of the beta test. Miscellaneous talk: 1) YMB lacks in providing valuable folder information, as in how much storage is a particular folder occupying, etc., available in the earlier interface. 2) YMB initially had now ads (hurray! ), but then, they did start showing ads (oh no). But due to user feedback, Yahoo! has decided to cut down the number of times ads are shown, although I believe it’s a temporary measure to muffle user protests in the crucial beta stage. 3) Any changes you make in your mail options WILL NOT take effect until you reload YMB. 4) Never hit the ‘Stop’ button of your browser while working in YMB, believe me, it can make some of their scripts unstable and give you screen long cryptic error messages that will make Microsoft’s error message writers hang their head in shame. 5) Virus scanning in YMB is silent, it won’t bother you with messages unless it finds something. 6) Not related to YMB actually, but now you can get an additional email address linked to your primary account for free. You can send messages from this too, and both IDs have the same inbox. The fun thing though is that the ‘.’ is now allowed in address name, so you can aim for that much-desired username. Also, you can change this additional address three times a year. This has been a really long post I know, but I think it will give you a better idea of what’s in store if you want to switch. Overall, despite (the few) drawbacks, I’d say (very impartially) that Yahoo! Mail Beta is far better than Gmail or Windows Live Mail Beta, the other major providers, having used all for a considerable period of time. That’s because Yahoo! responds to user feedback far more frequently and have a faster product cycle. The minor issues that exist will surely be rectified soon, making a killer product. Compare that with Gmail, which is simply using ‘beta testing’ as an excuse to keep a check on number of users. And Windows Live Mail is a very sorry story. To exaggerate a bit here, Yahoo! Mail Beta is going to revolutionize the way we email in the future; it IS the future of mail, as their ad campaign goes. See you in the Yahoo! Mail Beta community! Update: You MUST have a look at the comments section of this post, because it has some important updates/comment(s), even from the Yahoo! Mail Beta team itself! Wow! Yeah right that’s true. You CAN edit drafts by double clicking it. But as you said, it’s not very obvious. Thanks for that prompt reply though, and from the Yahoo! 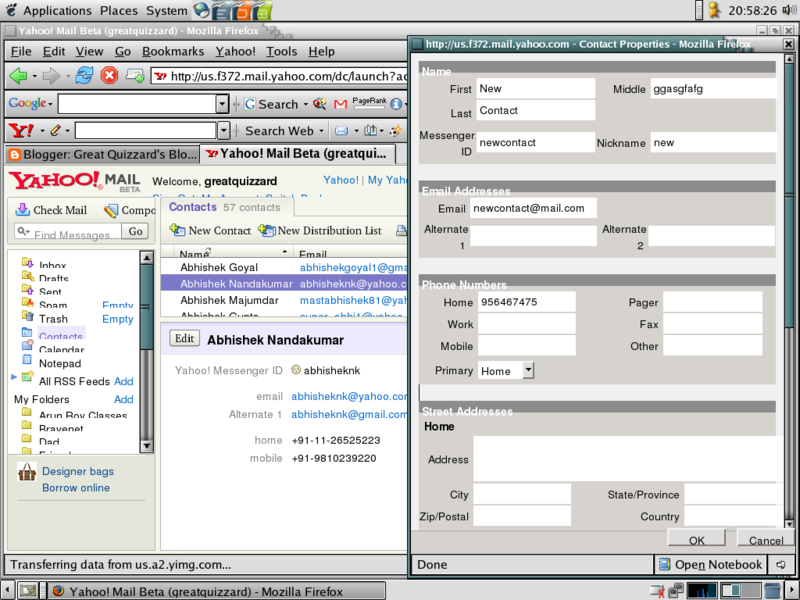 Mail Beta team itself (yipee! ), especially when I’d not specifically sent it to them. This just goes to show that Yahoo! pays a lot of attention to customer feedback and works on it. Great going guys! Yahoo! 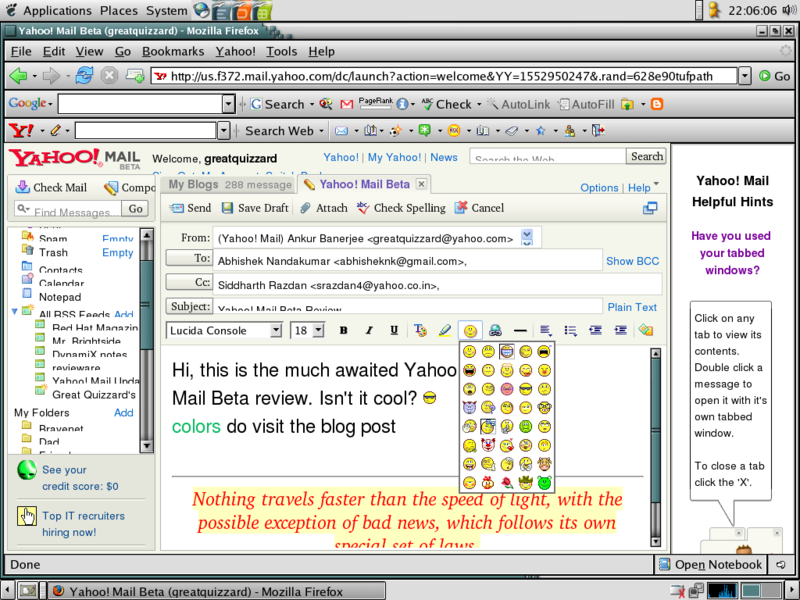 Mail Beta rocks!!! YMB will rule the email space in the future for sure. I take back my words. You CAN open a mail in a new tab by double clicking it in the reading pane. The earlier post gave me this idea. Now, it rocks, with a clean, tabbed interface. Didn’t know that, because it was not very obvious. But that settles a lot of questions. Thanks to the Yahoo! Mail Beta team for that reply, once again! Talking about the new spell check feature, it’s awesome. You have so many choice of languages, not only US English, but you also have an auto-detect feature that will check the language of the email and give correct spellings! Kewl! The problem with the RSS feed reader still exists, and I have had trouble adding quite a few types of feeds now. YMB has ben recently updated to have new features though, and it rocks!